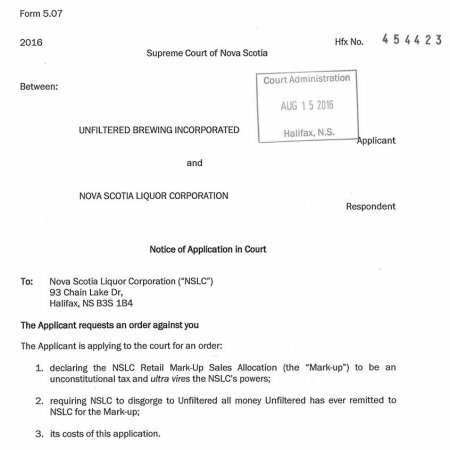 According to a Notice of Application in Court filed today with the Supreme Court of Nova Scotia, Unfiltered is required to pay the NSLC a Retail Mark-up Sales Allocation of 50 cents for each litre of beer sold out of its brewery, even though it does not sell beer at the NSLC or make use of its services. The Notice goes on to state that the NSLC does not have a clear written policy in place regarding this mark-up, and that the Nova Scotia Legislature has “not provided NSLC with the power to levy a tax.” Unfiltered has therefore received permission from the Attorney General of Nova Scotia to pursue legal action against NSLC. A motion for directions and date will take place on September 6th, at which point a date and time for a court hearing on the matter is expected to be set. For more details, see the full Application as posted to the Unfiltered Brewing Twitter feed earlier today.